Seriously who would want to hear these people speak? Haven’t we already heard enough from them? Former President Bill Clinton and twice-failed presidential candidate Hillary Clinton will be speaking to hundreds of empty seats on the first day of their tour. The Clintons are scheduled to kick off their speaking tour event, which is called “An Evening With The Clintons,” in Toronto, Canada on Tuesday evening. Just hours before the start of the event, which will be held at the Scotiabank Arena, TicketMaster reveals that there are still hundreds of tickets that are available. 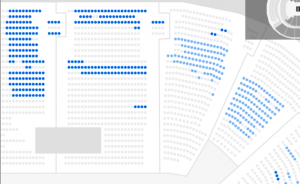 Look at all the blue dots, indicating tickets still available. “From the American presidency to the halls of the Senate and State Department to one of the United States’ most controversial and unpredictable presidential elections, they provide a unique perspective on the past, and remarkable insight into where we go from here,” the tour’s website reads.